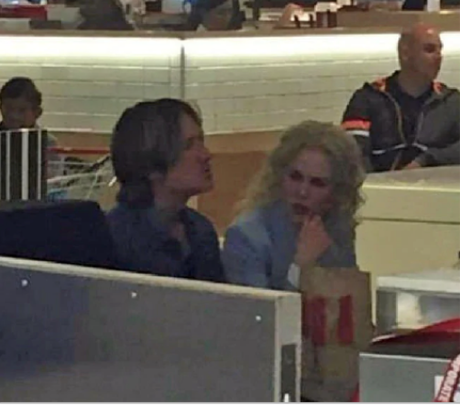 Nicole Kidman and Keith Urban have been spotted shopping at Kmart before indulging in some finger lickin' good KFC in Sydney yesterday. The superstar couple were photographed in a food court scoffing down some greasy chicken during a late-night shopping spree at Chatswood Chase mall in the lower north shore. Kidman and Urban, who originally hails from Caboolture, attempted to keep a low profile but their VIP visit to the discount giant may have blown their cover. "Just Spotted - Nicole Kidman and Keith Urban and kids shopping for kids clothes in K Mart Chatswood," one Facebook user wrote overnight. Kidman and Urban touched down in Australia for the 2018 ARIA Awards this week. Just days ago, Kidman opened up about an armed gunman being on the loose during filming of Destroyer, shutting down the set and forcing her and the cast and crew to "hit the floor". "We were in South Central LA shooting and they were like, 'Get inside, there's a shooter, a live shooter,'" she said at the time. "I'm like, 'What?' I've got the (prop) gun and I'm out on the street and they dragged me in, and I hit the floor because there was a shooter and helicopters."